The BSM VX-C Classic model is the most authentical copy of the british Vox Treble & Bass booster from the late 60‘s, used by many british bands at this time. It offers the original tone network and gain from the original, to make it the perfect copy of this out-of-production stompbox. Th e VX-C Classic model includes a tone control, that allows an extraordinary amount of versatility from a wooly bass tone up to a sparkling high-end vintage sound. It's also possible to produce the sound of a Wah-Wah pedal, set to a fixed middle position. In comparison to it's „hot brother“, the VX-T, the VX-C Classic offers less gain and a more old-style tone control, while the VX-T is more focussed to pronounce the mid frequencies. 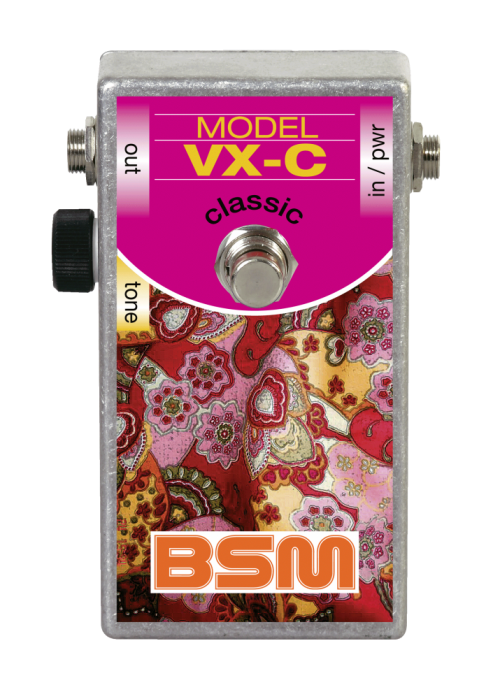 Another sibling of the BSM VX family is the RMG, the custom model for the typical „jingle jangle“ Roger McGuinn sound of the 60's, the perfect booster for all clean sounds. Almost all british rock guitarists using singlecoil pickup guitars, used some type of treble booster from the late 60‘s to the mid 70‘s. At the end of the seventies, these boosters were replaced with a new circuit from Japan, the socalled „Tube Screa- mer“ and other similar overdrive circuits. These were based on the old boosters and therefore had a very similar frequency response. The treble boosters on the other hands side, sadly fell into oblivion, despite their unique and inimitable sound. The VX-C Classic Booster is 100% true bypass and inserted between the guitar and the amplifier, not into the FX loop. The magical tone is achieved by the interaction between guitar pickup, booster and amplifier. The unit is powered by a single 9 volt battery with a current consumption of aprox. 50 uA. The average output level is 1dBm, the maximum output voltage when the strings are strucked really hard is 2V max. If you have any questions concerning our products, especially the BSM VX-C Clean Treble/Bass Booster, our tech-head and mastermind Mr. Bernd C. Meiser would be happy to talk to you. So don't hestitate any longer and send him an email to info@treblebooster.net or use the contact form to contact him.